> Does nortriptyline affect you the same way? I find that desipramine makes me somewhat edgy. Nortriptyline is more calming for me. > I never heard of nortriptyline or desipramine producing serotonin syndrome when combined with a SSRI. Can you provide a link to the webpage? 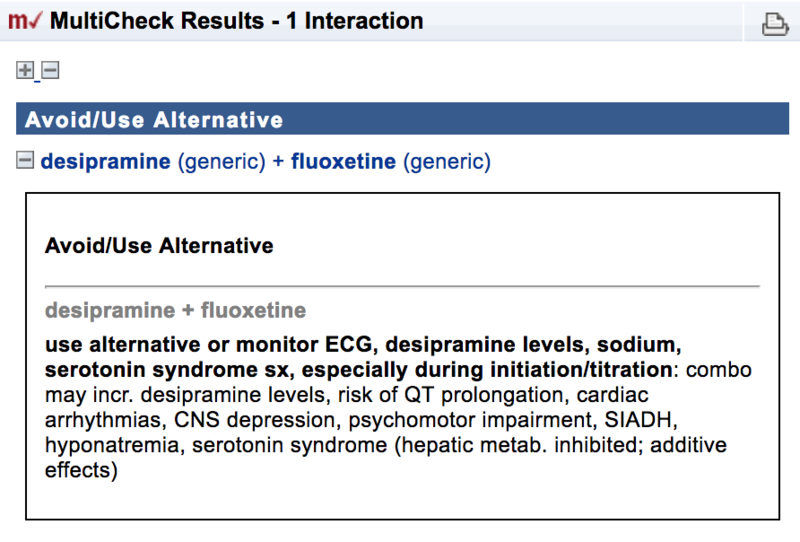 > What is your rationale for combining Prozac and desipramine? desipramine for adhd and motivation, fluoxetine for depression. Desipramine is literally a miracle drug for me when it comes to doing work or solving problems. In college I went from a D student with no direction to a straight A math major on desipramine. desip makes me irritable and angry, prozac makes me lethargic and fatigued. Rationale is trying to nullify the side effects while keeping the beneficial action of the two. I know usually this doesn't always work out. Anyway, seems like SSRIs are good for my anxiety and depression, norepi increasers are usually good for my adhd. I would like to find some strong norepinephrine RI that I could combine without my doctor bugging me to get weekly ekgs (I can see why he is cautious because he did almost kill me one time - legit stevens-johnson syndrome - long story). > I would discourage this. I would expect serotonin syndrome to develop using these two drugs in combination. I don't see how reversibility would prevent this. "This open clinical trial suggests that combined SSRI-moclobemide treatment appears to be safe and well tolerated."